I know you all have been waiting with bated breath wondering what I would share from this week's excursions. But before I unveil it. . .
Providence acts in so many kindly ways to perform so many seemingly minor services, all of which go toward reinforcing our love of God. God acts through natural means and the natural world to remind us always that He is present. Today, for me, was a case in point. I had thought about going to EPCOT again. I really like EPCOT--the gardens, the spaces, the architecture, the music, etc. But I was really tired of EPCOT. I didn't really want to venture the Magic Kingdom on a Saturday before the rest of the world was in school, so that left MGM Studios or Animal Kingdom. Frankly, I am not all that wowed by Animal Kingdom. The designers built it to give you a sense of adventure, of being lost in the tangle of thicket, with the net result that if there are more than 15 people in the park, it seems crowded. The pathways are difficult to negotiate, and there's an awful lot of jostling, bustling and general knocking about that a crowd-sky person doesn't care for. MGM, on the other hand, has fewer gardens, more indoorsy stuff that generally leaves me with the "been there, done that" feeling of the over-familiar. I opted for Animal Kingdom. Again sheer providence, because there is no coincidence, only purpose. When I got to the gate I saw an announcement that took my breath away. 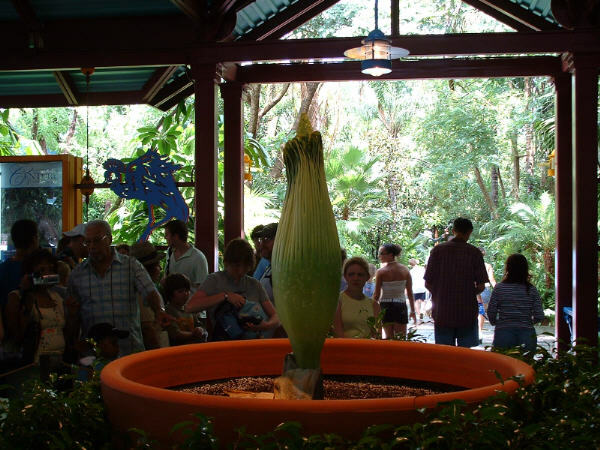 They had back in the hinterlands of the park a Titan Arum. Yes, children, that's what you'll be looking at. What, you may ask, is a Titan Arum. Why it's only the largest blossom structure in the world. 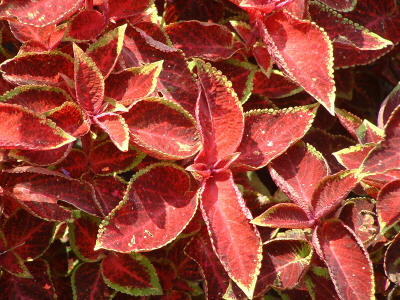 It's a plant that grown naturally in Sumatra. A few years back a specimen was taken to Kew Gardens and encouraged to grow. Since then fewer than 100 specimens in the United States have grown to blossom and stink up the house. Because you see, the blossom smells a great deal like rotting meat--the better to attract pollinator flies. 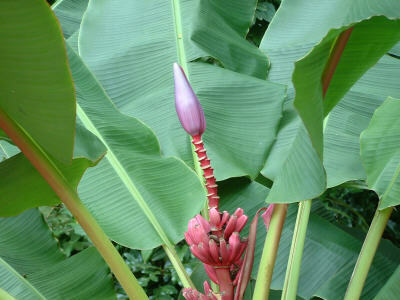 Well, the largest "flower" of this plant was about twelve feet high. I use the word "flower" advisedly because it really is a flower-cover. The flowers are much smaller structures at the base of the plant covered by what looks like a large blossom that closes up at night to help prevent self-pollination. 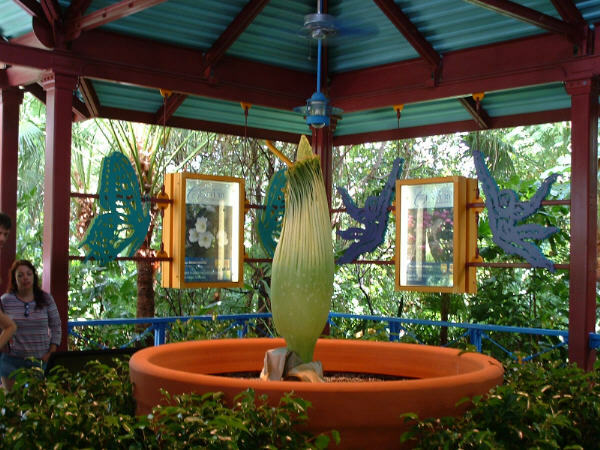 So it isn't really the largest single flower in the world--that honor is held by Rafflesia, but you've got to admit, a twelve foot blossom is a spectacular specimen. Now, the specimen you are about to see is on its way to blossoming, but a ways off--perhaps as much as two weeks to a month. This specimen was grown from a 134 pound tuber and is two weeks old at the time of these pictures. I honestly can't tell you when the last time I was so excited was. I'll be on the phone every day to the horticulturalist finding out when the blossom will open and I'll be out there the day it opens and every day after that I can be. This is one of those experiences that the mystics call "consolations." I don't look for them, but I am exceedingly thankful when they come around. This really is a blessing for me and I am so grateful to be able to share some small part of it. I know it isn't all that exciting for you all, but please accept my word that this is only overshadowed by the great good news that Spouse and Child return tomorrow. Hurray! The axial tilt problem that started back in June will come to an end and with it the blossoming to a Titan Arum! I have been to EPCOT hundreds of times. Yes, I'm one of those. I don't spend my time bemoaning the "disneyfication of culture." I leave that to people with far too much time on their hands. I love to walk around the parks and gardens and I love to watch the people here on vacation. That's really kind of a side point. I was there this afternoon, and after lo! 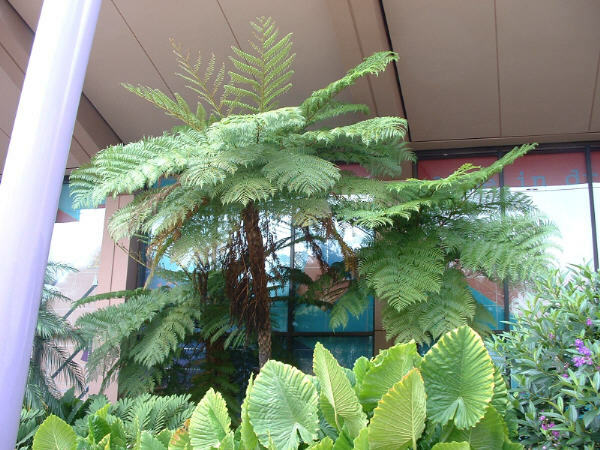 these many trips, I opened my eyes and what should I see but this lovely specimen of Dicksonia--a tree fern native to Australia and New Zealand and last of the remnant common on land several hundred million years ago--known variously (depending upon the part found) as Lepidodendron Sigillaria or Stigmaria. 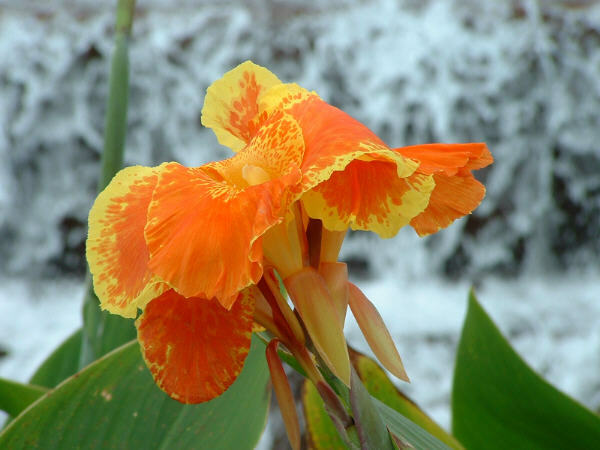 Also present near the grand waterworks fountain, this flower. I don't know it's name--I'm not a botantist. But it spoke to me as I passed so I took its picture. But the Dicksonia really wowed me. I thought I had seen it all, but it all goes to show what can happen when you open your eyes. This page is a archive of entries in the Nature, Science, & Mathematics category from August 2005. Nature, Science, & Mathematics: July 2005 is the previous archive. Nature, Science, & Mathematics: September 2005 is the next archive.